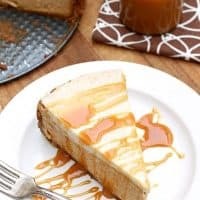 PUMPKIN CHEESECAKE WITH SOUR CREAM TOPPING — Smooth and creamy pumpkin cheesecake with a sweet sour cream topping. I’ve tried quite a few pumpkin cheesecake recipes over the years, and this Pumpkin Cheesecake with Sour Cream Topping is by far my favorite. My family wholeheartedly agrees! This cheesecake has a perfect, creamy texture, and the sweetened sour cream topping makes it extra special. If you’re hesitant about a sour cream topping on your cheesecake, don’t be. It’s fabulous! Of course, when it comes to cheesecake, the tricky part is getting a finished product with no cracks. But that’s part of the beauty of this recipe. Because of the sour cream topping, you don’t have to worry about cracks because they’re going to be covered up. Although I will say, this cheesecake tends to crack much less than other recipes I’ve tried. 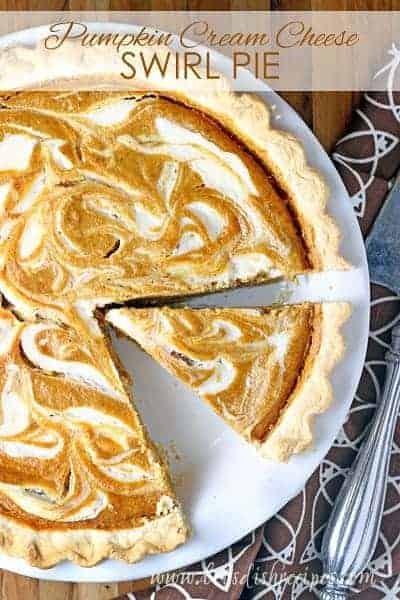 Trust me, you’re friends and family will all be impressed with the taste and appearance of this delicious pumpkin cheesecake. One final note: you really do want to make this cheesecake at least one day before serving. It’s so much better after sitting in the refrigerator overnight. 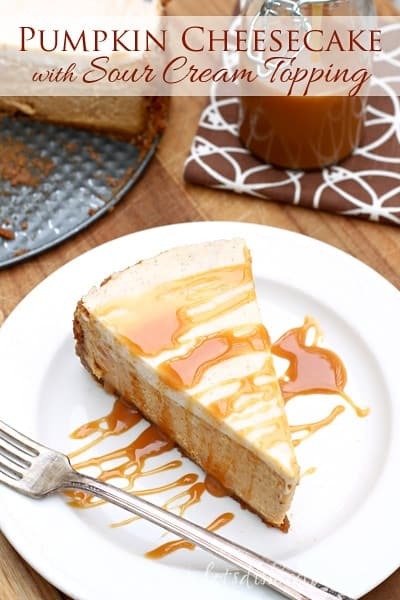 Smooth and creamy pumpkin cheesecake with a sweet sour cream topping. Preheat oven to 350 degrees. In a small bowl, combine graham cracker crumbs, sugar and cinnamon. Stir in melted butter. Press onto the bottom and part-way up the sides of a greased 9-inch springform pan. Bake at 350° for 5-7 minutes or until set. Cool for 10 minutes. 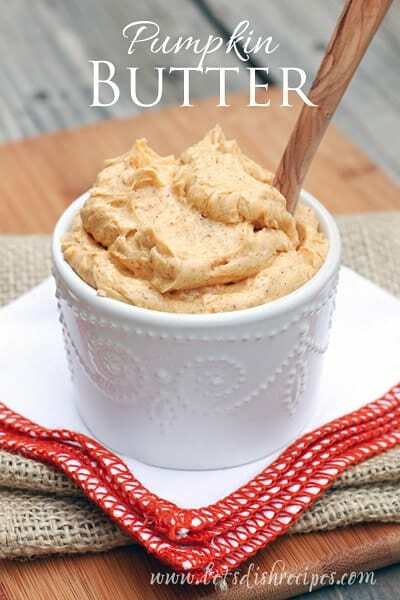 In a large bowl, beat the cream cheese, brown sugar and vanilla until smooth. Beat in the pumpkin, milk, cornstarch, cinnamon, nutmeg and ginger. Add eggs and beat on low speed until just combined. Pour into the prepared crust. Place the cheesecake on a baking sheet. Bake at 350° for 50-60 minutes or until center is almost set. Meanwhile, in a small bowl, combine the sour cream, sugar, vanilla and cinnamon for the topping. Spread carefully over baked cheesecake then return cheesecake to oven for 5 more minutes. Cool on a wire rack for 10 minutes. Carefully run a knife around edge of the pan to loosen. Cool on counter for 1 hour before placing cheesecake in the refrigerator to chill overnight. To serve: remove sides of pan and slice. If desired, drizzle with caramel sauce before serving. Pumpkin Cheesecake with sour cream toping, calls for 3 (8oz) cream cheese, I’ll use two next time. to much filling for a 9-inch springform pan. if you use 3 cream cheese you wont have any room to spread the sour cream topping.